So you work for Frank, I say to the tall stately blond carving out tiny bites of smoked salmon from a filet the color of the fleshy insides of a ripe cantaloupe. Well, you might say that, she says. I’m his daughter, Alex. Would you like a taste? Would I not. Frank Hederman’s smoked salmon is the kobe beef of seafood and at 50 euros a kilo almost as expensive. But god it’s lovely. So delicate and melt-in-your-mouth rich, like a pat of Irish butter. It doesn’t seem possible that the handsome full-grown woman stabbing wild salmon with toothpicks could actually be Frank’s daughter. Then again, how long has it been since Frank started up the Belvelly smoke house in Cobh? Must be going on thirty years. By god, it has been. You should get some of this, I tell Mr. Lynch when he strolls up. Salmon? he says dismissively. I should take salmon back to Nova Scotia? Are you daft? This isn’t just some crude smoked fish, I tell him. 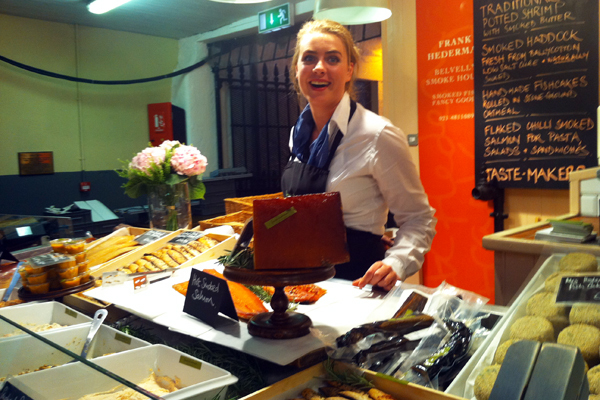 This is Mr. Frank Hederman’s celebrated beech smoked salmon and it’s the finest thing you’ll eat in Ireland. Try it. Alex holds out the cutting board to Mr. Lynch and he takes a round the size of a lifesaver. Good lord! he exclaims. That is nice. How much is it? The young woman holds up a small vacuum pack of thick fleshy salmon and says something about seven euros and change. Mr. Lynch hesitates. I tell Alex to give it to me. It’s worth every cent, I say in disgust. She wraps it in delicate tissue paper, as if it were a bunch of Jersey lilies, and puts it in a small bag with Frank Hederman’s signature running up the side. I’m not sharing this at the hotel, I tell Mr. Lynch. Just so you know. If you want some, better get your own. Mr. Lynch hems and haws but refuses to dig down in his pocket for the ten euro note I saw him squire away after lunch. He’ll be sorry later. Have you any of the smoked eel today, I ask Alex. All out, she says. But we’ve got the smocked mackerel. It’s delicious too. And the smoked mussels, cured in an olive oil vinagrette. Tell you what: Give me some of the smoked mussels. Just put them in the bag here. And as we walk away, I’m already thinking of what wine to get to go with my feast. None of which will be shared with Mr. Lynch. If you’re too cheap to buy the good Bordeaux, you don’t get to sip from my bottle. Frank’s salmon and mackerel are excellent. I didn’t want to ruin your omega high so remained mute that I live a three-hour drive from the smokehouse which provides Maxim’s with their salmon. Its a pleasure knowing the family.Franks Salmon is truely the best,and from cork,which is an added bonus! Excellent smoked salmon indeed Frank’s! in the Uk you have got to try the shropshire smokery wild salmon ( when avaialble ) or try there organic salmon it is a taste sensation again melts in the mouth… also for something different try there smoked duck proscuitto !!!!!! WoW.